Headquartered in Woodlawn, Maryland with ten regional offices across the country, the Centers for Medicare and Medicaid Services (CMS) is a government agency within the United States Department of Health and Human Services (HHS) that administers federal and state healthcare programs including Medicare, Medicaid and the Children’s Health Insurance Program. CMS oversees federal policies, such as the Health Insurance Portability and Accountability Act (HIPPA) and the Affordable Care Act (ACA), in addition to implementing quality standards of care and combating insurance fraud to facilitate and improve healthcare delivery to the American public. As a previous user of Microsoft Enterprise Suite, CMS had implemented SharePoint to handle projects and helpdesk functions. With a lack of formal processes in place and the growing complexity of a SharePoint database, CMS ran the risk of encountering governance and compliance issues in site creation, permissions and document management. In addition, CMS’ Office of Information Technology (OIT) was lacking the proper workflows to efficiently manage projects throughout their lifecycle, increasing the necessary time to complete each project and decreasing overall employee productivity. Helpdesk functionality was significantly slowed, with a single ticket requiring 24 to 32 hours to complete. Although the agency employed the use of Nintex automated workflow solutions, CMS OIT recognized the need for insight into best practices to enhance its potential with SharePoint. CMS OIT turned to DocPoint Solutions (DocPoint), a Fulton, Maryland-based expert in content services and Microsoft SharePoint, to optimize the agency’s project server solutions and improve business processes. 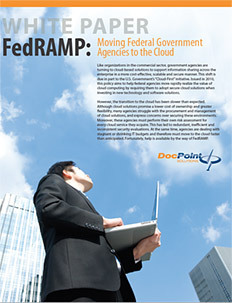 As a trusted SharePoint integrator with a wealth of experience successfully working with government agencies, DocPoint possessed the necessary vision to streamline workflows while ensuring regulatory compliance. 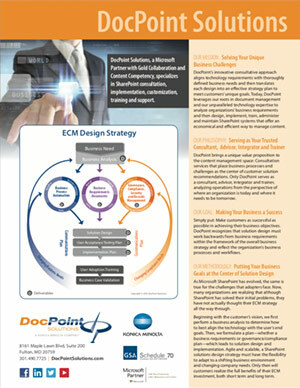 DocPoint analyzed processes and tools already in place to develop strategies for optimization. Using a combination of Nintex workflows and forms, DocPoint developed and deployed a solution to efficiently manage and track projects throughout their lifecycle and maintain compliance through proper governance. 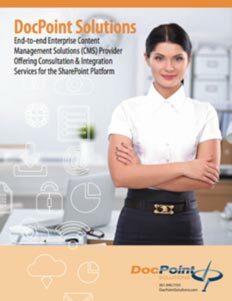 Additionally, DocPoint installed and configured AvePoint to manage and protect CMS’ SharePoint System. 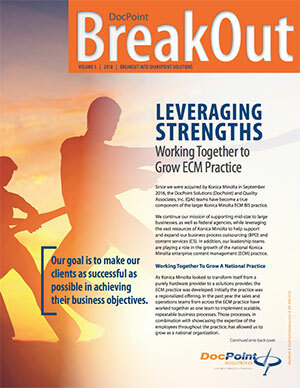 As a result of DocPoint’s solutions, CMS has experienced a great increase in productivity and significant cost savings. CMS’ development team is able to support the entire agency’s projects within the SharePoint environment, from project trackers and procurement plans to HR trackers, schedules for contracts and more. With the help of DocPoint’s process improvements, CMS OIT has doubled workload capacity, and data stored in SharePoint has grown by over half a terabyte. The helpdesk is now capable of closing tickets in just six to eight hours, enabling the completion of about eight tickets per day. With user-friendly workflows and formal lifecycle processes within SharePoint, CMS is able to track the status of each project at any given time, providing better support to internal customers with more accurate timeframes for project completion. In addition, DocPoint set up proper governance to allow for the compliant, secure sharing of sensitive documents and information. By utilizing inherent functionality and building Nintex workflows within SharePoint, DocPoint eliminated the need for a third-party tool or contractor to create and manage an outside database. As a result, CMS saw significant return on investment for its SharePoint deployment. “Our agency is saving approximately $1.5 million a year. We have realized an additional savings of $800,000 by replacing a few of our other outdated systems. We cannot say enough about the DocPoint Solutions team and truly appreciate their collaborative approach throughout every stage of the process. There hasn’t been anything that we have come across that we haven’t been able to solve as a team using SharePoint,” concluded Perry.